On Monday, Curt Schilling weighed in on the LeBron James-Larry Bird debate that no one seems to be having. Things have been known to get pretty wild on Curt Schilling’s social media pages. 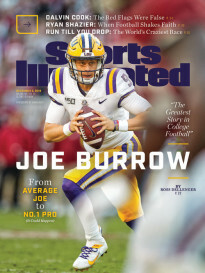 The longtime MLB pitcher and current ESPN analyst has been known to discuss his chickens, his family and troubling developments in pop culture. He also takes some strong political stances, some of them pretty offensive. 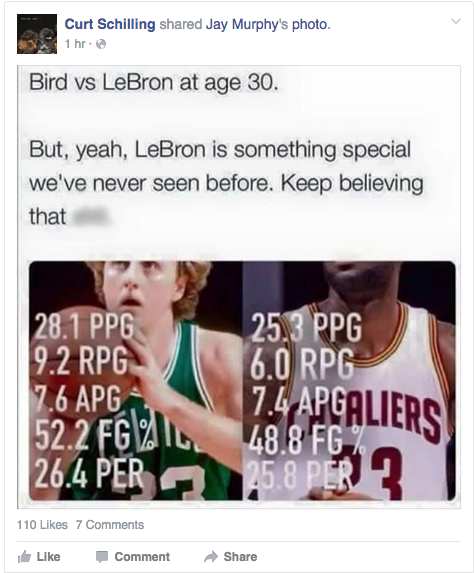 On Monday, Schilling weighed in on the LeBron James-Larry Bird debate that no one seems to be having by sharing a post on Facebook. Sure, LeBron James is maybe one of the greatest players to ever live, but that won’t stop Schilling from agreeing with this post, likely from a wildly biased Celtics fan. The numbers are correct here, for just the 30-year-old seasons of the two. Through the age of 30, LeBron James has outscored Bird with by an average of 2.9 points per game, and has averaged more assists. Bird has him in shooting efficiency, and owns a slight rebounding edge. Schilling’s Facebook is never boring.